I was involved in the examination for the afternoon session and the whole process went well. I only realised how tiring it was after I reached home. I can imagine how exhausted the students were, having firstly to wait for their turn, then suffer the agony of being quarantined. 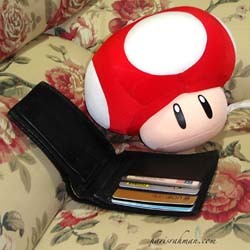 Toad doing some online shopping. Oi! Stay off my wallet!Judging from the postings on Facebook, everyone had mixed feelings about how they did during the exams. Usually apprehension is healthy. There's not much else anyone can do after the actual exam. We can only wait and watch, and wish our friends still waiting for their turn all the best. I must say that I was very impressed on the quality of the cases on show. They are all very fair, and not out to trick their candidates. Some of the cases can even allow them to shine. Those waiting for their turn tomorrow and Saturday don't have anything to fear. I also spend today reorganising the way things are posted on the site. I have added another journal stream, called themed posts. This is where the post according to the themes I selected yesterday will be put onto. Hopefully it will prevent the blog from getting clogged up. Today, I looked into three articles from NEJM. I thought they are pretty useful, and hopefully help my Medical Officers and students interested in current medical updates. The best of luck for those still waiting for tomorrow and Saturday. It will be over soon.